Untitled, 1960. Oil on canvas, 48 x 79 1/2 inches (121.9 x 201.9 cm). Collection of the Joan Mitchell Foundation, New York. © Estate of Joan Mitchell. Untitled, 1991. Pastel on paper diptych, 10 3/4 x 15 inches (27.3 x 38.1 cm). Collection of the Joan Mitchell Foundation, New York. © Estate of Joan Mitchell. Trees I, 1992. Color lithograph on two sheets, 57 x 82 inches, 34 + proofs, printed and published by Tyler Graphics, Ltd., Mt. Kisco, NY. Collection of the Joan Mitchell Foundation, New York. © Estate of Joan Mitchell. Mitchell's paintings can also be found in numerous public collections. Please review the Collections page of our website for a list and map of these institutions. Joan Mitchell's artwork is held in numerous public collections, nationally and internationally. Read more for the complete listings. Ici, 1992. Oil on canvas, left panel: 102 x 78 3/4 in. (259.1 x 200 cm), right panel: 102 3/8 x 78 7/8 in. (260 x 200.3 cm). Saint Louis Art Museum, Funds given by the Shoenberg Foundation, Inc. © Estate of Joan Mitchell. Posted, 1977. Oil on canvas, 110 x 157.5 inches (280 x 400 cm), Walker Art Center, Gift of Joanne and Philip Von Blon, 1989. © Estate of Joan Mitchell. The Joan Mitchell archives include correspondence, photographs, exhibition-related and other printed materials, books, sketches, manuscripts by writers, other items collected during her lifetime, and materials collected by her Estate and Foundation since 1992. Learn more. Copyright for works by Joan Mitchell resides with the Joan Mitchell Foundation, and we welcome requests to reproduce images of her work. The Foundation will review submitted information and if we approve a request, we will prepare a written license agreement. The Foundation requires copies of the item(s) with the reproduction, and in some cases, high-resolution image(s) of the work(s) in exchange for permission to reproduce. Learn more. The Joan Mitchell Catalogue Raisonné is presently researching Joan Mitchell’s paintings in preparation of a catalogue raisonné. This will be a scholarly publication documenting all of the artist’s painted work, including entries for each painting with complete descriptive information and detailed histories of ownership, exhibitions, and literature. If you are a current or previous owner of one or more of Mitchell’s paintings, please provide information on the artwork in your collection by clicking here. All information provided will remain strictly confidential. The Joan Mitchell Catalogue Raisonné is a project supported by the Joan Mitchell Foundation. For more information, visit the website of the Joan Mitchell Catalogue Raisonné at joanmitchellcr.org. Does the Foundation provide authentications? No, the Foundation does not authenticate works of art. Does the Foundation do appraisals of artwork by Joan Mitchell? No. The following organizations publish directories of their members, who provide appraisal services: Amercian Society of Appraisers, Appraisers Association of America, and the International Society of Appraisers. 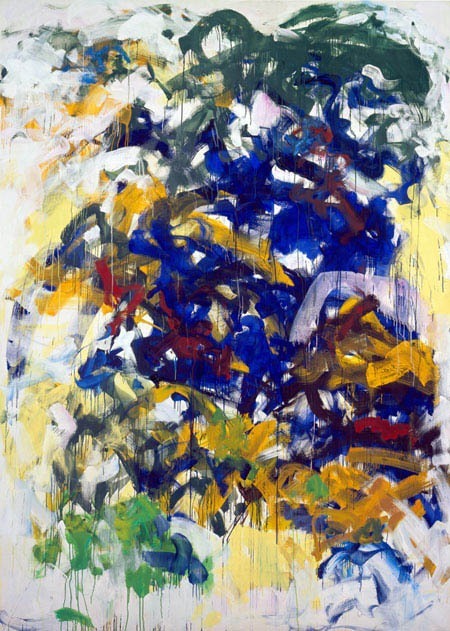 I want to reproduce an image by Joan Mitchell, what do I need to do? Please visit the page on copyright info for more details. Is there a Catalogue Raisonné of Joan Mitchell’s work? The Catalogue Raisonné project was established in 2015 and is now collecting information on the paintings of Joan Mitchell. Current or previous owners of Mitchell's work can contact the project manager at info@joanmitchellcr.org. I own a Joan Mitchell painting and would like to submit info on the artwork for the Catalogue Raisonné. Please contact us at info@joanmitchellcr.org to let us know about your painting.